I sat by the pond where a lone koi swam up to the surface and scoped me out with a single fisheye. Wisdom, or something like it, flickered in the black orb – a knowing of things I couldn’t yet name. Something familiar in this one, swimming in lazy circles, reminding me of someone. Rumors swirled in this part of Japan of the yamabushi who changed lost souls into koi. Sitting by the pond, I knew why this one seemed to know me. Lost no more, I called his name. A quiet splash in response, saying all he could not. How sweet to imagine those we love, swimming or flying, after they are “gone.” I love the idea of this; well executed! Thank you! I am slow at reading this week. Making my way there shortly…..
That’s a very moving little story and a great take on the prompt. Thanks, Sandra. I was reminded of the eyes of the dolphins I encountered last week. They seems to have a lot of stories behind them. What a wonderful thought, darling. Nicely written encounter…. Sometimes the word limit helps create the holes in the story that get filled with imagination. I like that. Thanks, Dawn. I am heading out to read shortly…. If only that were true. A very calming story. This story warmed my heart. There are those little glimpses into the next world that we do get see from time to time. What a great read. Thank you. Thanks, Renee! I’m glad it resonated with you. This lovely story crept from behind and took my breath away. Simply beautiful is all I can say. Thank you, Rochelle. It was an inspirational photo! This story was perfect for me in every way. There are worlds within worlds and unspoken yet clearly audible and visible signs all around us of them. Fantastic the way you pulled me in and held me under your spell until your last line let me breathe again. Wow. Thank you, Doug. I appreciated the photo prompt. 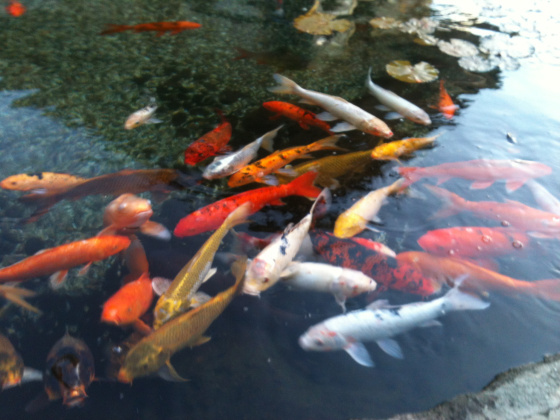 It reminded me of a restaurant in Honolulu – it had koi ponds around the tables. Lovely place! Nice twist on the tale, and on the tail. I’m reminded of Mr. Limpet: I wish, I wish, I wish I was a fish.